The newly protected Bronck Island property includes more than a mile of Hudson Riverfront. Photo: Robert Rodriguez, Jr.
NEW BALTIMORE (Greene County)— Scenic Hudson has conserved 147 acres of scenic and ecologically important land on Bronck Island in the Hudson River, completing efforts to protect the entire landscape on this former island connected to the mainland in the early 20th century. The transaction also marks another victory in Scenic Hudson’s Saving the Land That Matters Most campaign. Working with the Zacek family, Scenic Hudson acquired a conservation easement on the land, which features more than a mile of Hudson Riverfront, extensive tidal and non-tidal wetlands, marshes and swamps as well as upland forest and grasslands. 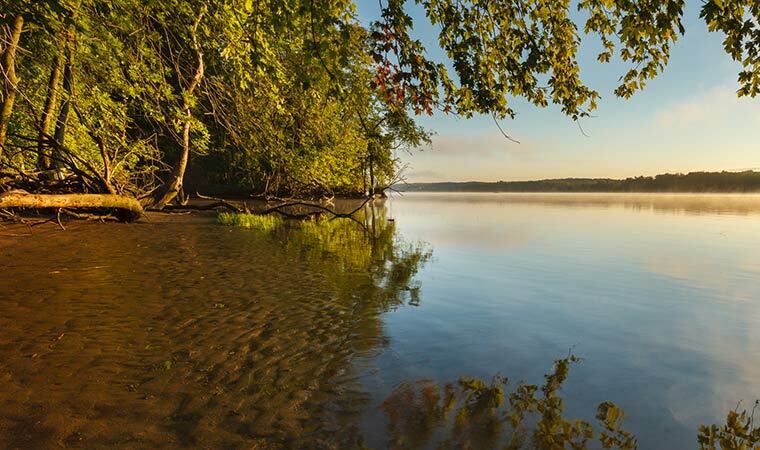 The property is located adjacent to 68 acres Scenic Hudson previously protected and 185 acres owned by New York State—resulting in the permanent protection of more 400 contiguous acres of riverfront land. Bronck Island was connected to the mainland during the first half of the 20th century when the channel behind the island was filled with dredge spoils. The land will continue to support the region’s agricultural economy—the Zacek family grazes beef cattle on the grasslands—and it will remain on the tax rolls. Scenic Hudson also acquired the rights to develop a public trail in the future that would connect people to the riverfront, supporting Greene County’s tourism economy. “Bronck Island contains some of the most important habitats along the entire Hudson River estuary. In addition, the land has a pastoral, secluded feeling that’s rare along the river. For these reasons, protecting this property has been a long-term goal of Scenic Hudson’s. We’re grateful to the Zacek family for working with us to permanently protect Bronck Island’s nature treasures,” said Scenic Hudson President Ned Sullivan. Scenic Hudson Land Project Manager Michael Knutson negotiated the transaction with the Zacek family. It was completed with funds from the organization’s Lila Acheson and DeWitt Wallace Land Preservation Endowment. Previously, the family donated a conservation easement on 124 acres of rolling fields, forests, streams and ravines that support its farm operations and form the foreground to outstanding view of the Catskill escarpment from County Route 61 (River Road), a popular location for local landscape painters. Bronck Island’s protection was rated of the highest importance by Scenic Hudson’s newly released Hudson Valley Conservation Strategy, a science-based plan for maximizing land investments to achieve multiple conservation objectives—key among them sustaining biodiversity and increasing resilience to rising sea levels and other climate change impacts. Bronck Island’s wetlands are projected to be relatively resilient to future sea level rise, meaning they’ll continue providing prime spawning grounds for signature fish species like shortnose sturgeon and American shad, key resting and breeding sites for migratory waterfowl, and habitat for myriad rare and endangered plants. At the same time, the island’s woodlands furnish a critical “bridge” across the Hudson, elsewhere a hurdle for ecological connectivity, between forests in the Catskills and Taconic Mountains. Scenic Hudson pursues its campaign to Save the Land That Matters Most realizing that preserving land provides the cornerstone of a sustainable Hudson Valley economy. Tourism in the 10-county region sustains nearly 85,000 jobs. Annual tourism spending in Greene County is $152.1-million and supports nearly 3,200 jobs. Protected lands also help grow other parts of the economy. A study by the Trust for Public Land notes that executives looking to relocate or start firms rank quality of life—including an abundance of parks and open space—higher than housing, cost of living and good schools. The U.S. Forest Service calculated in 2011 that over a 50-year lifetime one tree provides $62,000 worth of air pollution control and recycles $37,500 worth of water. Green infrastructure and open space conservation are often the cheapest way to safeguard drinking water, clean the air and achieve other environmental goals. Forested lands control erosion, absorb carbon dioxide and other harmful greenhouse gasses, and help shelter our houses from heat and wind. Wetlands serve as wildlife habitat, absorb storm and flood water and reduce pollutant loads in watershed runoff. Protecting open space also offers myriad human health benefits. Trees sequester pollutants that contribute to asthma, lung cancer, and cardiovascular disease, while releasing oxygen. In addition to helping keep drinking water clean and avoid flooding, conserved land maintains biodiversity, which plays an important role in preventing diseases such as West Nile virus and Lyme disease. Scenic Hudson’s campaign to Save the Land That Matters Most is a multi-year, collaborative effort with fellow land trusts, governments, individuals and businesses to protect lands of the highest scenic, ecological and agricultural significance throughout the Hudson Valley. Scenic Hudson works to protect and restore the Hudson River and its majestic landscape as an irreplaceable national treasure and a vital resource for residents and visitors. A crusader for the valley since 1963, we are credited with saving fabled Storm King Mountain from a destructive industrial project and launching the modern grass-roots environmental movement. Today with more than 25,000 ardent supporters, we are the largest environmental group focused on the Hudson River Valley. Our team of experts combines land acquisition, support for agriculture, citizen-based advocacy and sophisticated planning tools to create environmentally healthy communities, champion smart economic growth, open up riverfronts to the public and preserve the valley’s inspiring beauty and natural resources. To date Scenic Hudson has created or enhanced more than 65 parks, preserves and historic sites up and down the Hudson River and conserved almost 40,000 acres.